It has been a bit of a strange Easter Holiday this year. Firstly my daughter has stayed with her Dad for the whole of the break, which is the longest she has ever been away so I am really missing her. I have taken the opportunity of her absence to totally overhaul her bedroom though (with her permission) and I can't wait for her to see the result. It took two full days (including the construction of a flat pack monster) and yielded three full rubbish bags but it is now a teenage haven. For the moment. During the first week off Mr Magpie was working and I had three night shifts. I took the two youngest boys out on a few outings during the day and we got some chores done too. Over the Easter weekend we travelled up to Nottingham to see family. Our male teenager came too and his travel sickness relegated me to the back seat with the two younger boys. I took advantage of the journey to get some more work done on my blanket and the boys seemed to like having it draped over them as it moved left and right across my lap. Middle son in particular has taken quite a fancy to the blanket and is keen to know when it will be functional. He has also started to provide design input and due to this I have now commenced a true 'rainbow section'. 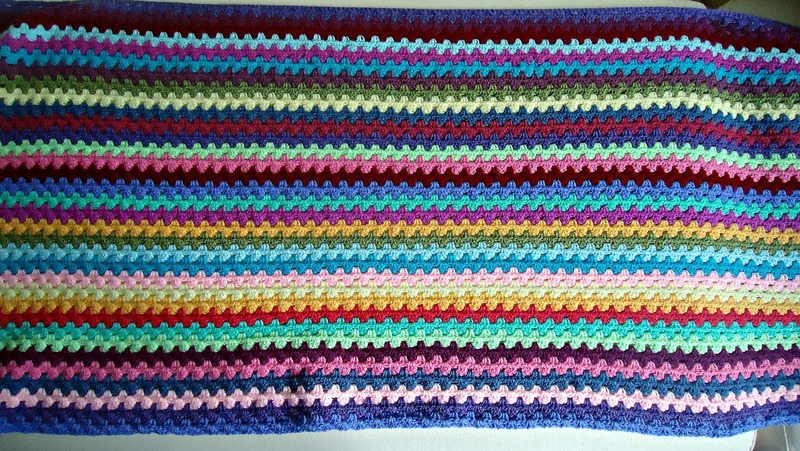 The weekend provided rather a lot of unexpected crochet time, so the blanket has grown considerably. 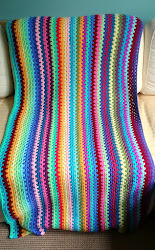 Each colour stripe comprises two rows of trebles and takes roughly an hour if I can work steadily without mistakes. 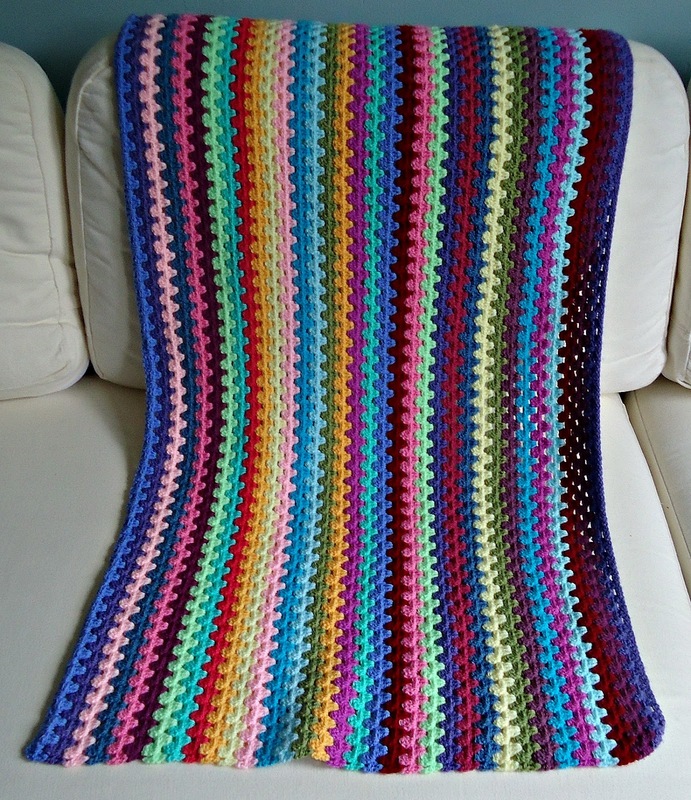 I have now completed 34 stripes and have realised that I have probably made the blanket too wide. 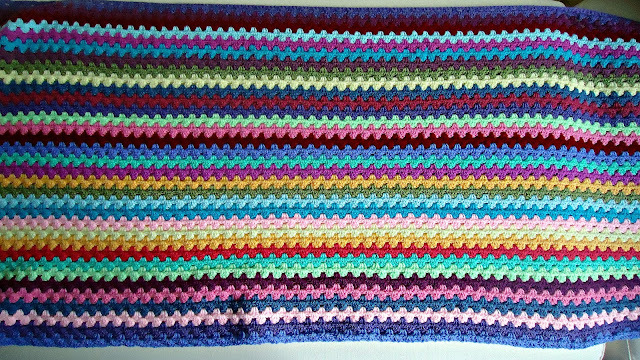 Lucy of Attic24 crocheted 60 stripes on her granny stripe but I think that I will need nearer 100 to make the length look right against the width, which is almost six feet. A little way to go then. When the children go back to school I will be gearing up to full production mode on the sewing machine so I might have to ask Mr Magpie to hide the blanket away from me for a while to avoid temptation, it really is totally addictive! After Easter my poor littlest Magpie whose leg is almost better caught a nasty tummy bug and has spent most of the week in a weakened state on the sofa. We have had to postpone his birthday party for a week to give him time to recover. For the last few days we are hoping to have a few more little outings and finish off the overhaul of the house. I promise to show you around my crafty space soon. What a beautiful blanket. I love the colours - very soothing. I love your blanket! Great colors! What type of yarn are you using?